What do you get when you combine popcorn and bacon? Well, after you piece back the shrapnel of your blown mind, you'll have a bag of bacon-flavored popcorn to snack on! Bacon fanatics will absolutely love this match made in snack heaven! The tasty flavors of bacon have been perfectly infused into lightly buttered microwave popcorn. Safe for vegans and vegetarians, gluten-free and cholesterol-free Bacon Pop is sure to delight all lovers of snack! Made in the USA. Apparently, the geniuses behind Bacon Pop conjured up a culinary wizard to combine bacon, butter, salt, and popcorn into one ridiculously tasty snack. I'm sure that a stormy night, lightning, and a hunch-backed assistant were involved, too! It certainly feels as if some sort of food wizard devised this delicious combination of popcorn and bacon! Yes, it tastes like bacon! And yes, it tastes stupendous! At first, many people guffawed at our candy Bacon Lollipops, but anyone who has ventured to try them knows that they're amazingly delicious. 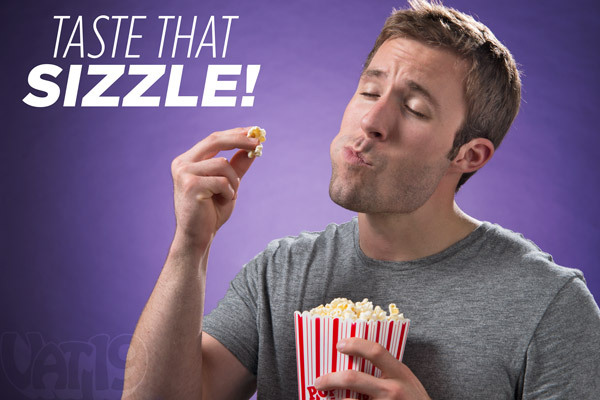 So, do not doubt us again or you'll miss out on the incredible taste of bacon-flavored popcorn! Bacon Pop features everything you love about popcorn: the crunch, a hint of salt, a dab of butter, a splash of oil, and the undeniable sizzle of bacon. It's just sooooo good! 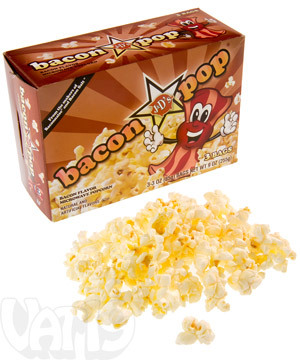 Bacon lovers won't be able to get enough of this delicious bacon-flavored popcorn! Now everybody can enjoy the sizzle of bacon! While every snack can't be as healthy as a wheatgrass strudel, Bacon Pop is surprisingly glutton-free despite its mega taste. Bacon Pop is gluten-free, cholesterol-free, safe for vegans and vegetarians, and contains only 130 calories per serving! Bacon Popcorn is made in the USA. All great things come in threes! Each box of Bacon Pop includes three microwaveable bags. You can share each bag with up to 3 people, so there's plenty of tasty bacon popcorn to go around! 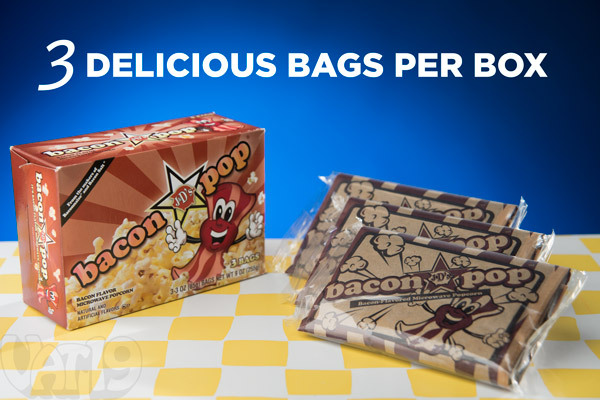 Each box of Bacon Pop Bacon Popcorn includes three microwaveable bags. 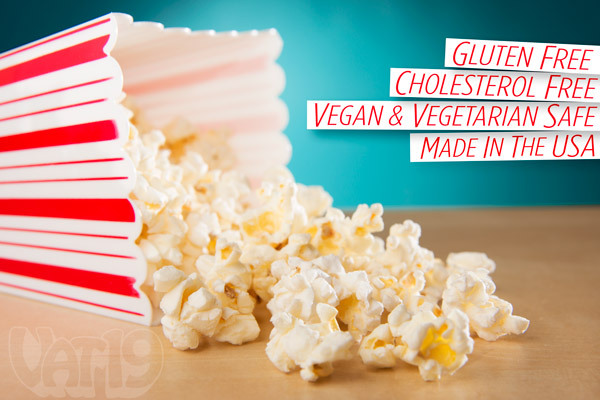 Answer: Popcorn, palm oil, salt, hydrolyzed soy and corn protein, and natural and artificial flavors. Question: Can you post the nutrition facts? Answer: Per serving: Calories: 130, Total Fat: 8g (Saturated Fat: 4g, Trans Fat: 0g), Cholesterol: 0, Sodium: 220mg, Total Carbohydrate: 14g (Dietary Fiber: 3g, Sugars: 0g), Protein: 2g. Question: Is there actual bacon in it? Answer: Nope, that would be impossible as meat has a tendency to go bad. Instead, they use a soy seasoning whose taste is indistinguishable from bacon. It's similar to the concept of Bac~Os. Question: Seriously, is it actually good? Answer: We don't take snacking lightly. We study snacks. We test snacks. We travel to snack conventions. So, yeah, it tastes good because we know what good should taste like. And it tastes like Bacon Pop. Now, buy, buy, buy!